Welcome to Cat Island. No, make that Cat Islands—plural! Because in Japan, there are at least two locations in Japan with that nickname. Perhaps the most well-known "neko shima" (猫島) or "cat island" is Tashirojima, an island in Miyagi Prefecture. In the 1950s, over a thousand people lived on the island. Now, there are around a hundred, with the majority being in their 70s. Cats, however, thrive on the island and apparently outnumber the locals. Dogs are prohibited on Tashirojima, and people feed the felines, believing they bring good luck. Vets check up on them, making sure the animals are healthy. And tourism has sprouted up around the animals, with vacationers visiting the island just to see the cats. In the past, the island's fishermen kept cats around to kill mice, which would eat the silkworms needed to make fishing nets. The island is also home to a Shinto cat shrine. There's an area of Tashirojima called "Manga Island," because manga artist Shotaro Ishinomori (Cyborg 009) designed cat-shaped lodges for visitors, which houses manga art, and has a gift shop. You can also rent fishing poles and bicycles. Recently, another "cat island", this one called Aoshima in Ehime Prefecture, has become quite popular online after Twitter user Kolmetoista uploaded the following pics of cats that inhabit the island. 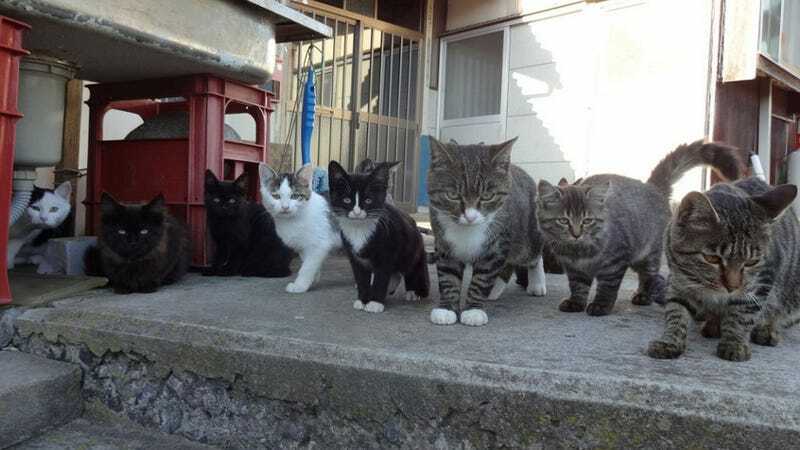 Only sixteen people live on Aoshima, meaning that, like on Tashirojima, these four-legged friends outnumber the humans. Kolmetoista's photos are appearing on numerous Japanese blogs, and one of them was retweeted over seventeen thousand times.